The votes are in. 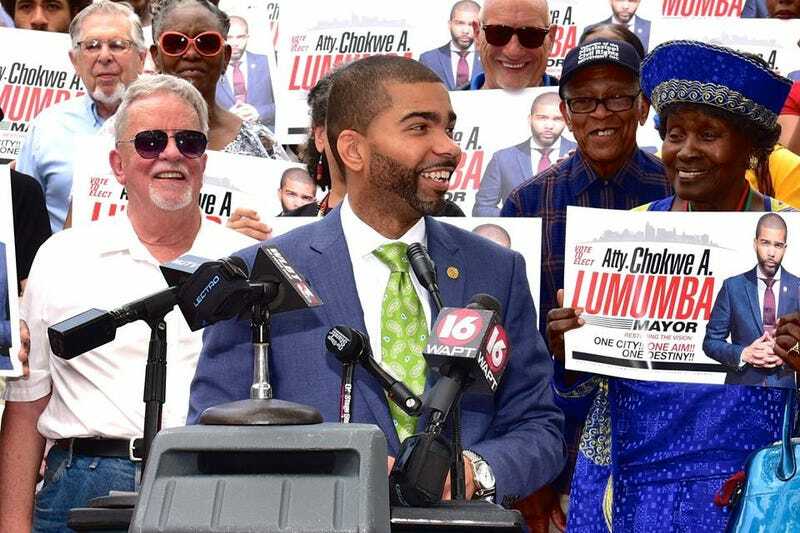 Winning over 55 percent of the vote against eight other candidates, attorney Chokwe Antar Lumumba, 34—son of the late Jackson, Miss., Mayor Chokwe Lumumba and community activist Nubia Lumumba—has won the Jackson Democratic mayoral primary race. Lumumba’s leading opposition, Hinds County Supervisor Robert Graham and five-term state Sen. John Horhn (D-Jackson), trailed behind him all night, the Clarion-Ledger reports. Jackson Mayor Tony Yarber conceded earlier in the evening Tuesday and said that he was throwing his full support behind Lumumba, who is poised not only to continue the radical and transformative work that shaped his parents’ lives—and his own—but to lead Jackson into a revolutionary future. Chokwe Antar Lumumba ran and lost the 2014 mayoral election to then-Councilman Yarber. At the time that he announced his candidacy in the wake of his father’s unexpected death after less than a year in office, Lumumba made it clear that he was not running on his family’s name, but on his credentials and commitment to his people and the city of Jackson as a whole. Lumumba is managing partner of Lumumba & Associates and a member of the Malcolm X Grassroots Movement. He received his Bachelor of Arts degree from Tuskegee University in 2005 and earned his Juris Doctor degree and a certificate in sports and entertainment law from the Thurgood Marshall School of Law at Texas Southern University. Lumumba will face off against a field of candidates—including Republican primary winner Jason D. Wells; independents Jaclyn Mask, Gwen Ward Osborne Chapman and Kenneth Swarts; and Libertarian Corinthian Sanders—in the general election June 6, but he is assumed by many energized and hopeful Jackson citizens to be the city’s next mayor.